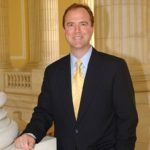 Adam Bennett Schiff is the U.S Representative for California’s 28th congressional district. He has served in Congress since 2001. He is a member of the Democratic Party. Schiff represented the 27th and 29th Districts between 2001 and 2013, which included the areas of Alhambra, Altadena, San Gabriel, Burbank, Glendale, South Pasadena, Temple City, Monterey Park, and Pasadena. In 2010, his district was re-districted to include new areas including La Canada Flint ridge, La Crescenta-Montrose and Sun land-Tujunga, as well as large slices of central Los Angeles including Hollywood, the Hollywood Hills, West Hollywood, Echo Park, Silver Lake, and Los Feliz, in addition to areas he represented before like Burbank, Glendale, and the western part of Pasadena. "But it is equally incontrovertible that if our intelligence gathering process is seriously flawed, we had better find out and find out fast if we are to avoid another Sept. 11." "An America that inspires hope in its ideals must complement an America that inspires awe in its strength." "Unless action is taken soon – unless we can display the same vision of that earlier period – we will lose the treasure of California’s open space and environmental beauty." "The prompt assimilation of that intelligence will be essential if we are to avoid another September 11th." "America has a critical role to play as the most powerful member of the world community." "In fact, the converse is true: At a time when the United States has been called on for a level of moral leadership, vision and inspiration not seen since World War II, we cannot afford to dissemble about crimes against humanity." "It is now conventional wisdom that Americans do not care why we went to war in Iraq, that it is enough that the world is better off without Saddam Hussein." "Notwithstanding these setbacks, the dream of a beautiful American orchestra goes on, and I share Dr. King’s faith that each year we move inexorably closer to a magnificent opening night." "Americans are blessed with great plenty; we are a generous people and we have a moral obligation to assist those who are suffering from poverty, disease, war and famine."